Bottled water is a drain on the environment: The U.S. public goes through about 50 billion water bottles a year, and most of those plastic containers are not recycled, according to Elizabeth Royte’s 2008 book Bottlemania: How Water Went on Sale and Why We Bought It. Transporting the bottles and keeping them cold also burns fossil fuels, which give off greenhouse gases. And groundwater pumping by bottled-water companies draws heavily on underground aquifers and harms watersheds, according to the Sierra Club, an environmental nonprofit. And according to some estimates, it takes up to three liters of water to produce one liter of bottled water. Yet more than U.S. $100 billion is spent every year on bottled water globally. In many cities in developing countries where there is not a safe source of tap water, bottled water becomes a somewhat trusted option. But in the U.S., where tap water is federally regulated and often screened for dangerous pollutants, the public drinks 21 gallons (79 liters) of bottled water per capita per year on average, according to the Columbia Water Center at Columbia University’s Earth Institute in New York. The bottled-water industry is so successful, it has outpaced milk, coffee, and juice in number of gallons of drinks sold—putting it behind only beer and soda. Though the sale and consumption of bottled water is still on the rise, certain policymakers and activists have taken steps to reduce it and encourage people to drink tap. 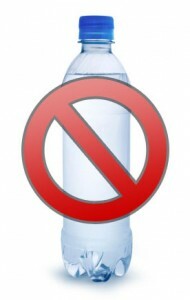 In September 2009, the Australian city of Bundanoon became the first city in the world to completely ban bottled water from its stores’ shelves, installing water fountains around the city instead. Among U.S. cities that have taken action are San Francisco and Seattle, which no longer buy water for city use, and Chicago, which added a five-cent tax on each bottle. Several restaurants in those cities have also given up bottled for filtered tap. Other cities are also considering taking action. The tide toward tap has boosted businesses that make reusable water bottles, especially aluminum and stainless steel varieties. Many reusable bottles are made of polycarbonate plastic, but those often contain bisphenol A (BPA), a chemical linked to reproductive problems and heart disease. In response, some polycarbonate-bottle makers have phased out BPA and advertise “BPA-free” products. Not only does bottled water contribute to excessive waste, but it costs us a thousand times more than water from our faucet at home, and it’s likely no safer or cleaner, experts say. A 2008 investigation by the nonprofit Environmental Working Group found some bottled water is sullied with untested industrial chemicals and may not necessarily be cleaner than tap water. Water aside, the plastic used in single-use bottles can pose more of a contamination threat than the water. A safe plastic if used only once, #1 polyethylene terephthalate (PET or PETE) is the most common resin used in disposable bottles. However, as #1 bottles are reused, as they commonly are, they can leach chemicals such as DEHA, a possible human carcinogen, and benzyl butyl phthalate (BBP), a potential hormone disruptor. And because the plastic is porous you’ll likely get a swill of harmful bacteria with each gulp if you reuse the bottles. More than 80 percent of recyclable plastic bottles end up in landfills each year. They do not break down naturally and release toxic chemicals when they finally do decompose, according to the Columbia Water Center. Another major problem with bottled water, according to Columbia, is that a traditionally public good has been privatized. Bottled water companies gain high profits by drawing water from public water sources, putting it in plastic containers, and reselling it at 2,900 times the price of regular tap. Some experts contend that the profits from bottled water companies could go toward improving public water supplies and infrastructure—making better water for everyone.